Bindi Cole, 'Shem', 2009, Archival pigment print on rag paper, 100 x 82cm. Bindi Cole is a Wathaurung woman and a budding photography, video and installation artist from Melbourne. 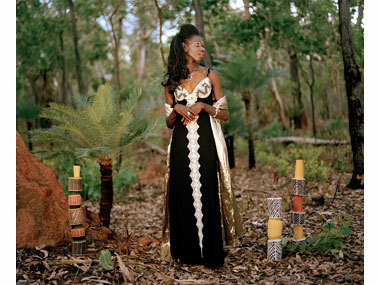 In November 2009, she won the $25,000 Deadly Art Award for her evocative photograph Ajay, one in a series of photographs bringing transgender women 'Sistagirls' from Tiwi Islands to our attention. After "years of remaining silent" as she puts it, Bindi completed a Diploma in Applied Photography and then a Bachelor of Visual Arts at Ballarat University. She was a 2008 finalist of the Telstra National Aboriginal and Torres Strait Islander Art Awards and won the 2007 Victorian Art Award for photography. Briefly describe yourself. When and how did you first become interested in art and photography? How long have you been a practicing artist? I am a woman who has found my voice through art, after many years of remaining silent, as a result, all of my artwork is underpinned by social commentary and critique. I became interested in photography as a very young child and in photography as a means of creative expression after finishing studying photography at TAFE. I’ve been exhibiting art for three years now including photography, video and installation. What is important to you in your photography? What are you aspiring for (as a means of expression) with the art that you create? What is important changes with each new body of work that I make. Sometimes it is purely cathartic, about taking something uncomfortable within me and showing it to the world as a means of purging. Sometimes, its about reconciling something with the world, my identity or others identities perhaps. At other times, it is about celebration, maybe a celebration of diversity or some such. However, it is always important for me to try to be as technically good at photography or whatever else I am creating as I can be. I would love for my photography to change the way people think and perceive things. Wathaurung woman and Melbourne-based artist Bindi Cole. What do you find to be the most exciting and challenging parts about being an artist / photographer? The most exciting parts for me is the ability to see something in my mind and to then be able to create it. To become aware of an injustice in the world and say something about it and to have people look at the work and experience their reaction, which can also be the most challenging part. Especially when the work is political and pointed and people don’t like it. I’ve had my fair share of negative press and what irks me is that though it stems from the work I create, it is never about the work, its always a personal dig at me. That stuff can be hard. In your opinion, what role and growth opportunities does a contemporary Aboriginal artist have in Australia and more globally? This is a hard question. I guess the role of a comtemporary Aboriginal artist, in my opinion, is to provoke. I like provoking and I like art that does the same. In particular, artists such as Tony Albert, Richard Bell and the whole Proppa Now collective and other artists such as Brook Andrew, Adam Hill, Fiona Foley and many others. Who have been your greatest heroes in helping you take this creative path? How did they influence you? My family, friends, community and ancestors have been my greatest influences. In particular, my mum (Vicki Reynolds) who was a writer and who taught me how to make yourself vulnerable by examining through art those things that are difficult to look at. There have been many others that have had a huge influence on me and the way I work and that have also provided real life opportunities and helped me to where I am today. I have had a few mentors such as Ponch Hawkes and Donna Jackson, strong women who have had amazing careers and are completely generous with themselves and their time. Which artists and photographers do you find inspirational? So many! A real mix of people that I admire from afar, people that are a part of my life and artists from history: Brook Andrew, Ponch Hawkes, Gordon Hookey, Maree Clarke, Megan Cadd, Reko Rennie, Vicki Couzens, Richard Bell, Vernon Ah Kee, Donna Jackson, Paola Balla, Destiny Deacon, Tracey Moffat, Adam Hill, Yoko Ono, Ash Keating, Fiona Foley, Ricky Maynard, Tony Albert, Gary Lee, Sue Ford, Tracey Emin, Troy Anthony Bayliss… gosh, I could go on and on. Describe the space that you work in? Forever moving! At home, I have a desk with my computer surrounded by heaps of crap. I’ve virtually boxed myself in. If I’m making something then I do it on the dining table. But when I shoot, I travel to wherever I need to go and drag my equipment, lights and whatever else I need. In the mornings, when I’m inspired, well rested and when my eyes fall in love with something. Bind Cole, 'Ajay' from the series Sistagirls, 2009, Archival pigment print on rag paper, 100 x 82cm. What do you want people to take away with them when they see your photographs? Maybe some insight, a bit of a laugh and the desire to mull things over. Tell us about the last photograph or collection you created and what was the story behind it / what inspired you? My current body of work is called Sistagirls and it is a collection of stylized portraits of a community of Aboriginal transgender women from the Tiwi Islands. A few years back I met an Aboriginal Drag Queen called Foxxy Empire who is the alter ego of Jason De Santis. I was immediately taken with Foxxy, having just spent time creating artwork that was about reconciling my identity with the world, I wondered how Foxxy reconciled hers. You couldn’t be more of a minority being Aboriginal, Gay and a Drag Queen and yet to be so strong and proud was something that immediately resonated with me. So I photographed Foxxy and during the course of that she told me about the community that she came from on Tiwi Island and about the Sistagirls and how he had always wanted a photographer to go there to capture them. On Tiwi there is a population of around 2500 people and of that around 50 of them are Sistagirls. This amazed me and I found myself intrigued in how they reconciled their identities. So over the next year and a half I worked with Jason to go to Tiwi and photograph this amazing community. Late last year, this desire was fulfilled and I was able to spend five weeks on Tiwi living with the Sistagirls creating a series of highly stylised portraits of them. I loaded a barge with a four-wheel drive, lights, a generator, cameras and enough film to fill a suitcase. Each day brought an emotional roller coaster from moments of elation around what was being achieved with the images to complete anxiety from the many dramas that occurred. This time has affected me in a profound way. The Sistagirls have touched my heart. I only hope that in some way I have captured the essence of who they are and the spirit of their community and that the public falls in love with them just as I have. Please share with us anything you would like to say, feel, communicate about being the winner of the 2009 Deadly Art Awards? I was really blown away to win. There were so many beautiful artworks and such a heavy representation of painting that I really thought I didn’t stand a chance. The photo that won was in fact, a portrait of one of the Sistagirls and in the same way that it afforded me an opportunity for pride, it did so for the Sistagirls as well. The money has come in handy in putting together the full series and it was nice to not have to apply for funding for once. I encourage all artists to enter competitions, it’s a great platform and opportunity to see your work amongst your peers. A slideshow of Bindi's works from the series Sistagirls are avaliable here at the Aboriginal Art Directory. Click to view the Bindi Cole Artist Slideshow. Sistagirls is curently exhibiting at Nellie Castan Gallery in Melbourne until the 31st July, then traveling to Sydney, Adelaide and Darwin. There is also a screening of the accompanying documentary at 6.30pm, Friday 30th July at 'The Age' Theatre in Melbourne. Please see Bindi's blog www.bindicoleissnaphappy.blogspot.com for more details.